AT THE SAME TIME as the world was hailing the people of a divided Germany for tearing down the Berlin Wall, the British Government was doing its damnedest to make sure that its artificial partition of Ireland was maintained through a network of spy-posts and concrete blockades across border roads that had been in place as far back as the 1920s. In the 1990s, the people of the border counties, renowned for their imagination and dogged determination, showed the same tireless spirit in chipping away at ‘Britain’s Berlin Wall’. They were known as ‘Border-Busters’. ELLA O’DWYER spoke to some of them. IN THE 1950s, border roads were blocked with heavy steel spikes but there weren’t too many cars in those times and people could get through by carrying their pushbikes through the obstacles and be on their way once they’d crossed over. Twenty years later, in the 1970s, a campaign began to reopen roads blocked or blown up by the British Army. Monaghan Sinn Féin Councillor Pat Treanor was still at school. The British Army seemed to have tired of the cat and mouse game in which they’d block a road, local people would reopen it, the Brits would close it again, only for campaigners to open it once more. Shortly afterwards, British Army checkpoints started going up and roads that had remained open were blocked. “For the likes of Clones here, out of the eight roads leading into it, five were either closed or had a permanent checkpoint on them,” Pat Treanor explains. “That had social, economic and all sorts of effects on the town. Two thirds of the business in the hinterland round Clones came from County Fermanagh so these road closures wreaked havoc economically. The British Government and the unionists argued that they were trying to thwart IRA attacks by blocking the roads and cutting off ‘escape routes to safe havens’ south of the border. 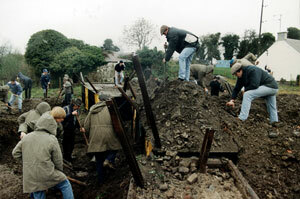 IRA attacks continued unabated. So what was the point of the British Army spending huge amounts of money, troops and resources in trying to seal the border? “The British strategy seemed to be to control the local community – to funnel locals through the checkpoints so that they could monitor movements, intimidate people and try to gather information and informers,” Pat Treanor says. People were getting increasingly annoyed during the 1980s. It came to a head when Derryvollen Crossing, between Scotstown and Roslea, was closed. Local people had found their own way of getting round the road blocks and had improvised a pathway to get between the two parishes to go about their business. When the Brits closed that, there was uproar from the locals, supported by the parish priest, Fr McCluskey. The blockade affected people going to Mass on a Sunday and other important aspects of the social life of a rural community. Pat Treanor notes the particular courage and determination of one local contractor who used his heavy machinery to remove the concrete barriers on the road. “That was risky because the machinery was expensive and there was always the risk that the Brits would confiscate it. “The contractor’s stand sparked the desire to do something to address the worsening situation. The local community called a meeting in Clones of business people, farmers and families from both sides of the border: anyone who was affected by the road closures. In fact, a load of stones arrived mysteriously at one road reopening and it’s thought that they were supplied by a local Protestant. All members of the community stood to gain from the reopenings,” Pat Treanor says. Alongside the hard toil of earth moving, digging and shovelling went lobbying, work that was harder in a different way. As the campaign developed it became clear that people further south weren’t really aware of the reality of the border but local workers and farmers were good at explaining all the inconvenience involved. For instance, people might have to keep a second car over the border in order to get to work at all. Gradually, the campaign garnered support from members of the public from throughout the 26 Counties. But the mainstream Irish media didn’t really want to know. And with more and more European Union legislation and fanfare about breaking down barriers and opening up borders, the reinforcing of the border dividing Ireland seemed all the more incongruous, as Pat Treanor explains. By this stage of the campaign the road workers had become fast learners. Shovels and pick-axes were all very fine for certain tasks but heavy machinery was needed for the most formidable barriers built by the British Army’s Royal Engineers. “One very brave man by the name of Eugene Cosgrove, from Roslea, decided to do a fund-raiser to get the money for a Hi-Mac digger. When the Brits would come in to try to obstruct the reopening of the roads he’d use the arm of the digger to keep them back. And, of course, the work was getting done much faster. And so the battle between the British Army and the Border-Busters swung to and fro, until the IRA cessation on 31 August 1994. The Berlin Wall was finally breached on 9 November 1989. After nearly three decades keeping East and West Berliners apart, suddenly it was gone. The same happened in Ireland – for those who recognised the border in the first place. "I’m from Kiltyclogher, the home of Seán Mac Diarmada, a quarter of a mile from the Fermanagh border. My republican beliefs got me involved in the reopening of the roads when I was about 17. The Brits didn’t need checkpoints around Kiltyclogher because the bridges were blown up around the village in the 1970s, ultimately costing Peter Brennan and Eddie McCaffery their lives. One fella drowned as he was trying to cross over a remaining ridge of the bridge and the other got lost going through the fields. I was working on the blockade at a place called Garrison, Dooard, on the Fermanagh border, six miles out of Kiltyclogher. We had no crossing from Leitrim to Fermanagh. It destroyed the town of Kiltyclogher. It was all part of the resistance as far as I was concerned – against British occupation. I never recognised the border anyhow." "I was 21 when I got involved in the campaign. I come a mile and a half from Drumfurrer, on the southern side of the border. It was a rural area and there were farmers with land on both sides of the border because of the way it was divided up in 1921 when lines were drawn down through farms. Apart from An Phoblacht, the only ones to give us any real coverage were the Northern Standard, the local paper. And the almost total suppression of news coverage by RTÉ and the Dublin papers of the border closures and their effects affected people’s knowledge of what was going on in their own country. The local football team was having a draw and we were over in the west of Ireland, in Castlebar, at a Connacht semi-final, trying to sell tickets for the draw. People asked where we were from and when we’d say Monaghan they’d say, ‘Oh, you’re from the North, the Six Counties.’ It was unbelievable that they didn’t even know where the border crossed. Of course, the media had always tried to isolate the ‘Troubles’ from the rest of the country." "I went looking for financial reimbursement for improvements made in the area and I wrote to the NIO for reimbursement for the improvement work we did on a border road. I got an answer back that they wouldn’t refund us for our roadwork as the improvements hadn’t been pre-approved!" "It was a real cat and mouse game. We had decoys, with women and men working round the clock. Women drove tractors and everyone got their wellies on – it was shoulders to the wheel. The unionist community were in a strange position. They wanted the roads closed but they wanted them open at the same time because they needed to be able to go about their business too. There were numerous checkpoints along the borders between Derry and Tyrone. But the Irish Government also kept their posts in Donegal, places Castlefin Barracks where 32 gardaí and four sergeants were stationed; and Lifford, six miles from Castlefinn, had 32 gardaí and four sergeants. Nowadays, stations like these run on a part-time basis and as a member of the Lifford District Council and the Justice and Policing Committee I’ve asked how many gardaí we have on the beat. I never get an answer."